Details of the current situation are given on the Current Road Programme page (list view), which includes all roads programmed for the next few decades. Below can be found various maps and news items. The Futures page has a wishlist of projects that would be useful in the long term, and for curiosity's sake, there is also a map of the old network of Trunk and Link roads that predated the modern N(ational) and R(egional) system. Current road building programme (since end 2015) with more information in list format. Schemes under construction are marked with a red star. Use the link under the map to open in a full screen. Schemes completed mostly between 2005 and 2015 with more information in list format. Use the link under the map to open in a full screen. Old road schemes and projects listed in the National Road Needs Study 1994-1999, completed by 2007. More information in list format. Update 14/04/2019: This escaped my notice back at the end of February, but the emerging preferred route for the N56/N13 scheme in Letterkenny was revealed. It's a more ambitious project than envisaged, which will also replace a part of the N13 heading south from the town, aswell as making improvements to the N13 to the east, and completing the N56 by bridging the River Swilly. It will also turn many minor and local roads into overbridges so that they will avoid entering and exiting the new roads, leaving them dedicated to passing and long distance traffic. The map on this site has been updated - zoom in to Letterkenny to see the layout. 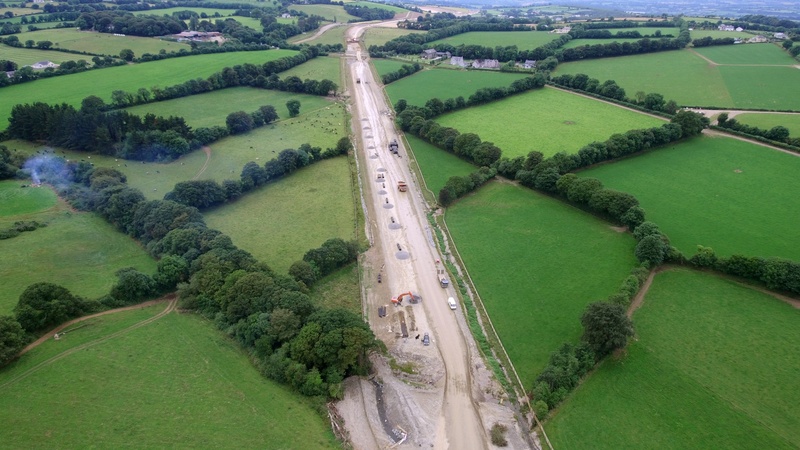 On Twitter, Sligo County Council have put up some preliminary photos of the work that has been carried out so far on the N4 Collooney-Castlebaldwin dual carriageway, a 14 km scheme. Topsoil strip can be seen, with soil testing trenches. In the 4th photo the soil has been removed revealing the peat underneath. Update 28/03/2019: Finally! The much-beleaguered Gorey Motorway Services Area has opened yesterday, the 28th of March. Construction on this began in 2013 and was completed in 2014 whereupon it sat idle for years as legal battles played out. The nearby M11 Enniscorthy Bypass will open this summer and will provide some traffic for the MSA. Here's a dramatic shot of the N25 New Ross bridge. Update 02/03/2019: The route of the N14 Letterkenny-Lifford dual carriageway has been unveiled. The scheme alignment on this site has been updated. We can expect a route to be announced for the N2 Slane Bypass in March. Previously a plan for a bypass of this town was refused permission, so the planners will be more cautious this time around. "The eagerly anticipated New Ross Bridge and N25 Bypass will open at a yet to be determined date in 2020, rather than this summer, as had been previously anticipated. The news, disclosed to South Kilkenny Councillors at the February meeting of the Piltown Municipal District, was not greeted with any palpable sense of disappointment on members' behalves. As late as last September, Councillors had been told that the project was due to open by June of this year." As a consolation, here is a picture of the bridge towers rising out of the mist. Update 23/02/2019: An announcement has been made that work has kicked off on the much-needed N4 Collooney-Castlebaldwin. This replaces the worst remaining section of N4 and a road with one of the highest accident rates in the country. "The sod has officially been turned on the new stretch of road on the N4 by An Taoiseach Leo Varadkar. Around 120million euro is to be spent on the stretch between Collooney and Castlebaldwin is expected to completed in the next 2 and half years. It's a bitter sweet day though however 30 families or more who lost their loved one on this stretch of road. Taoiseach Leo Varadkar and Minister for Transport Shane Ross say that opening up Sligo and the area is a key feature of the governments 2040 Plan." There has been an update on the National Children's Hospital budget overrun debacle. Thankfully, all the money to be taken from the transport budget will be cut from the A5 Dublin to Derry road, which presumably includes planned schemes on the N2. This isn't a big deal as Brexit may restrict Republic of Ireland's access to Northern Ireland anyway, making an upgraded N2/A5 moot. In the Dail today, Minister Shane Ross confirmed that the timeline for the N2 Slane Bypass is 2021 for start of construction and 2024 to open. This bypass has been needed for decades due to the unusual layout of the town and its river bridge. Some wondrous pics ,  of the M11 Enniscorthy bypass's progress have been reposted on Boards from the scheme website. Also a few nice shots of the N25, including a night shot. The preferred route for the N15 Ballybofey/Stranorlar bypass has been revealed. This road is part of a set of schemes for Donegal. The others are N56 Letterkenny ring road and N14 Letterkenny-Lifford. The alignment for the scheme has been updated on the map on this site. Update 08/02/2019: This escaped my attention as no official announcement was made, but the N5 Ballaghderreen-Scramogue project was approved by An Bord Pleanala back in January. This long, 35 km single carriageway road will open up access to Mayo and was desribed in detail in the update on this site from the 16/12/2017. There has been some press coverage. Update 02/02/2019: Things have been quiet for a few months, as we settle into 2019. A sluggish Minister for Transport is not helping to get projects off the ground. We're expecting the Gorey Motorway Services Area to open shortly, but no date is available any more. Dunkettle is fully signed off and is in pre-construction. The N4 scheme looks ready to begin. The rest require some form of Cabinet approval first. In addition, the N52 Ardee Bypass and some schemes on the N56 in Donegal will kick off this year. This is all assuming the Transport budget is not reduced as a result of the huge cost overrun in the new National Children's Hospital. This project is now running over a billion euro overbudget and it has been indicated that money will have to be saved elsewhere. 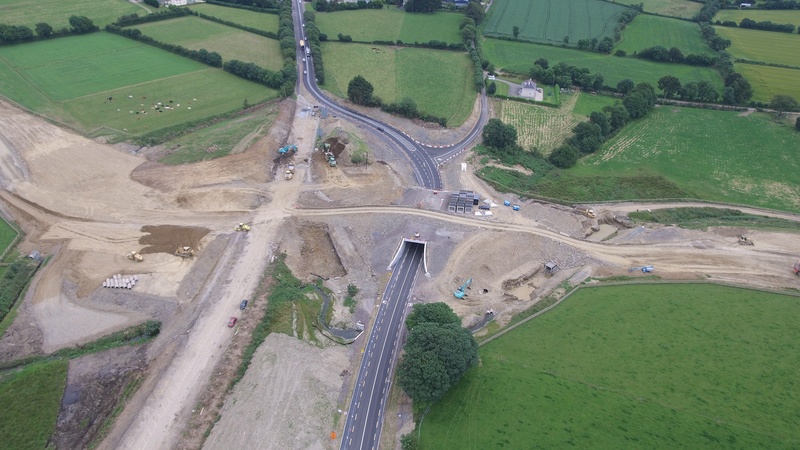 "This new stretch of motorway will bypass Adare as far as the new access road to Rathkeale and then continue as a dual carriageway to Foynes." Update 16/11/2018: There are finally end dates for the two schemes which are currently under construction. The M11 Enniscorthy bypass should open on 31st July 2019 and N25 New Ross bypass in August 2019. The www.m11gtoe.ie website has put up some great images which are mirrored on Boards here and here. Six years after construction began, the much benighted Gorey Motorway Services Area is set to open on 14th Feb 2019. Along with the East Athlone and Kilcullen areas, it was delayed by a lengthy court case which prevented it opening though it was structurally complete. The other two will open around next summer. Update 09/10/2018: It has been a long time since the last update. This is because there really is not much going on - many planning decisions are progressing very slowly and it won't be until next year that new starts can be expected to start coming on stream. Today is Budget day, and it has been announced that the Dunkettle interchange and N4 Collooney-Castlebaldwin dual carriageway will be funded next year, so they are likely to be new starts within the next 12 months. The N22 Macroom-Ballyvourney road was meant to start next year too, and may already be funded, so the fact that it wasn't mentioned today may not be significant. In the next few months the TII should give us more of an idea what schemes in the pipeline can be expected to make planning progress in 2019. There is still no planning decision on N5 Ballaghderreen-Scramoge, despite it being promised back in July. The latest news is that it will be forthcoming in November. The Galway Bypass required cabinet approval to move to the next stage, which has been forthcoming. It will now seek planning permission, with the submission expected by the end of this month and an oral hearing next year. It is reasonable to expect a lot of planning objections due to the scale of this project and how transformative it will be for the city, as well as the disruption during construction. The Enniscorthy bypass is making good progress and is now expected to be complete in April 2019 instead of summer. However the news with the New Ross bypass is not as good, as its bridge component has been progressing slowly and so the whole scheme is not expected to open to traffic until summary 2019. Here are some pictures of it, and a long shot from a nearby mountaintop. Update 17/07/2018: The construction company Sisk have been awarded the construction tender for the huge M8/N25/N40 Dunkettle interchange project, which involves rebuilding a roundabout to a fully freeflow junction. For now, they will work on design, with construction not until the first quarter of 2019. On the 4th July, the €220M M28 Cork-Ringaskiddy motorway has been approved by the planning board. The Cork Evening Echo mentions an "M48" link road - it is unclear what this refers to and may involve connecting the new road to the N27 Airport Road. 2024 is the target completion date. At some stage in the process, it was decided that since it is intended to reclassify the N40 as a motorway, there would not be any non-motorway sections of this new road north of the townload of Barnahely just west of Ringaskiddy. Therefore I have changed the colour and metadata of this road on this site. The approval has come as welcome news to the city of Cork, the government, and local politicians, but not local residents, as detailed in the Irish Times article linked above. Although the planning board deny there will be any negative effects on the local community, it seems hard to believe that a HGV route would not have adverse consequences for an area of residential suburbia, given that pollution levels from the HGV sector are off the charts. The light at the end of the tunnel is that by the time this road opens in 2024, it is likely that electrification of the transport sector should be well underway, which will mitigate negative environmental effects. The effect on noise levels is harder to ascertain though. Finally, work on fitting out the services area on the M11 at Gorey will begin shortly and is expected to take 4 months to complete, so we should see the opening of this facility in November. Update 09/07/2018: The construction company Sisk have been awarded the construction tender for the huge M8/N25/N40 Dunkettle interchange project, which involves rebuilding a roundabout to a fully freeflow junction. For now, they will work on design, with construction not until the first quarter of 2019. On the 4th July, the €220M M28 Cork-Ringaskiddy motorway was approved by the planning board. The Cork Evening Echo mentions an "M48" link road - it is unclear what this refers to and may involve connecting the new road to the N27 Airport Road. 2024 is the target completion date. The approval has come as welcome news to the city of Cork, the government, and local politicians, but not local residents, as detailed in the Irish Times article linked above. Although the planning board deny there will be any negative effects on the local community, it seems hard to believe that a HGV route would not have adverse consequences for an area of residential suburbia, given that pollution levels from the HGV sector are off the charts. The light at the end of the tunnel is that by the time this road opens in 2024, it is likely that electrification of the transport sector will be well underway, which will mitigate negative environmental effects. The effect on noise levels is harder to ascertain. Planning permission for N5 Ballaghderreen-Scramoge single carriageway road is expected this month. Update 11/06/2018: Some wondrous pictures have been taken of the M7 widening project between Naas and Newbridge in Kildare. They have been uploaded to Boards.ie: , . These ones were taken by Marno21. There are some dedicated Boards.ie posters who go to extraordinary lengths to get their photos. Update 03/06/2018: A series of stunning images of the N25 Barrow Bridge have been made available on the Kilkenny People's website. Thankfully Boards.ie poster M17 has reposted them on Boards so a login isn't needed. It bears repeating that the scale of what is being built here really is astonishing for the size of the town. As an additional treat, a drone video of the bridge has also been uploaded. "Up to 45 jobs are due to come on stream with the opening of a new motorway service station close to Moate in June of 2019. A spokesperson for Circle K, formerly Topaz, confirmed the move to the Westmeath Independent this week hot on the heels of a recent rebranding of the fuel and convenience retail giant, and a €35 million investment in four sites, including the new service stop along the M6 at Fassagh next year. The development of the new 24-hour service station close to Moate will boast the full Circle K offering with full deli, fuel and convenience store, the company spokesperson said, adding that it will be fully owned and operated by the company rather than a franchisee. Some €35 million of that figure is earmarked for four sites in the next 18/24 months, including new stations between Athlone and Moate, and Gorey in Co Wexford. Progress on the controversial 24-hour motorway service stop along the M6 had been held up for over two years due to a legal challenge centred on the contract process by the former NRA for design, build, operation and finance of the service station and shop businesses in Moate and Kilcullen, as well as the fit-out and operation of the third facility along the M11 near Gorey." Good news for the N5 Westport-Turlough dual carriageway. This has moved to tender and is now likely to start construction in 2019 - not 2020 as previously envisaged - as announced by Minister Michael Ring. "THE Minister for Rural and Community Development Michael Ring has welcomed the news that the N5 Westport to Turlough road project will go to e-Tender for the procurement of a main contractor. Mayo County Council will be working with TII in progressing this scheme. The total cost of the investment in this project is approximately €170 million which includes land, construction and all other costs." Update 29/04/2018: Progress is slowly but surely being made on the huge bridge over the River Barrow as part of the N25 New Ross bypass. These pictures are reposted from the scheme's Facebook page. Work has begun on the main span of the Barrow Bridge starting with travellers being erected to facilitate the construction works. A BAM Iridium spokesperson said: "The River Barrow Bridge is progressing with three sections of the deck poured on the west side of the River Barrow and the support falsework being erected on the east side of the river." The first pour was expected towards the end of March. The travellers, which are bespoke designed falsework, are being erected at Pier 4 and on the west side of the river and will support the falsework for pouring the deck. "They will 'creep' along pouring the deck itself from previously poured sections." Most of the local roads that cross the route have had the structures installed with traffic now passing through in the next few weeks. "We will be putting final surfaces on the roads, installing safety barriers and signage," the spokesperson said. The N25 at Glenmore is in Phase 3 of traffic management. "This will allow us to finish the underbridge and complete the roundabout - the next Traffic Management switch is planned for the end of April." Just one update from the M11 Enniscorthy bypass on this occasion: a very stark black and white shot of a high-level overbridge. The N22 Ballyvourney-Macroom dual carriageway has gone to tender. If all goes according to plan and with a decent level of funding this should start in late 2019. This is a bit sooner than the currently programmed date of 2020. Update 03/04/2018: On a recent road trip, some pictures of the M17 have been uploaded and linked on the page. It was a very nice evening for a spin. The route taken was Athenry (from the Galway side) as far as the first roundabout on the Tuam bypass. Update 25/02/2018: Some excellent pictures have been scraped from the official N25 New Ross website and reposted on Boards and SkyscraperCity. They are well worth a look. Update 17/02/2018: Yesterday the government's long awaited Ireland 2040 planning document and the associated investment-focussed National Development Plan were revealed. The list of roads to be progressed as part of this were leaked some time ago, but they bear repeating. They are listed on page 43 of the National Development Plan and a map is shown a few pages afterwards. N4 Mullingar to Longford and N4 Carrick on Shannon: 68 km of dual carriageway. An additional 14 km will start construction in 2020. N13 Ballybofey Stranorlar Bypass, N13/N14/N56 Letterkenny Bypass and Dual Carriageway to Manorcunningham, N14 Manorcunningham to Lifford : Total of 40 km of dual carriageway in the Letterkenny area. M50 Dublin Port south access: This one wasn't expected to be progressed so soon, as previously it had a target date of 2035. It will see the entrance to the Dublin Port Tunnel at East Wall Road connected to the south docks area either underground or using a high level bridge. A tunnel is more likely due to the need to avoid shipping. N3 Clonee to M50, M4 Maynooth to Leixlip, M11 from Jn 4 M50 to Kilmacanogue : These are all motorway widening/conversion to motorway. Update 04/02/2018: In a post on Boards, the user M17 has shown some photos from the M11 Enniscorthy bypass. They show overbridges in various states of construction. The project won't be complete until 2019. Update 26/01/2018: It has been confirmed that planning permission will be lodged for the N6 Galway City Bypass by the end of February. 40 houses will need to be demolished to make way and a further 10 will become uninhabitable. These latter houses will probably be knocked down too. Based on the length of time it will take to process the application, and that an oral hearing will need to be held afterwards, we can expect a decision by the end of this year. Common sense has prevailed on the new M20 Limerick-Cork motorway as it has now been confirmed by the Taoiseach Leo Varadkar that it will follow the original alignment, that is, it will parallel the existing N20 closely, passing to the west. The only funding for N11 improvements included in the 2018 allocation is €100,000 for the N11 Kilmacanogue parallel service road. The works at Kilmacanogue will address safe access to and from the petrol station on the southbound lane..... Capacity will need to be increased as far south as junction eight (Kilmacanogue) to cater for current and projected traffic demands. South of Kilmacanogue and as far as Coyne's Cross, there is no need to increase capacity, but to bring this section of the corridor up to the required standard, existing direct access and left on/left off junctions should be closed or reconfigured. M11/M50 junction at Bray (Junction 4) to Kilmacanogue (Junction 8): Widen to 6 lanes, reorganise junctions, close side access, build parallel roads. Kilmacanogue to Coyne's Cross (Junction 14). Reorganise junctions, close side access, build parallel roads and (perhaps) upgrade to motorway. Traffic levels on this section of N11/M11 very close to Dublin are high. According to NRA Traffic Data, they are showing as 77k and 69k on the Bray motorway bypass, and 51k south of Kilmacanogue. Update 11/01/2018: As anticipated, widening work has now begun on the M7 mainline at Naas. Initial work on the Dunkettle Interchange upgrade in Cork has begun. The photo accompanying the article shows clearance work at this location. N2 Ardee-Castleblayney and Clontibret-NI Border: This is the new N2 dual carriageway that was previously mentioned on this site. Together with the A5 scheme in Northern Ireland, this will create a high quality Dublin-Derry route. N3 M50 to Clonee: The non-motorway part of the N3 near Dublin will be widened to 6 lanes, have side accesses closed, and probably be redesignated motorway. N3 upgrade near Dublin: This may be inside the M50 as otherwise it would seem to overlap with the previous scheme. M4 Maynooth-Leixlip: Widening to 6 lanes. There used be a related scheme to convert the N4 from the M50 to Leixlip to a motorway, but this seems to have dropped off the radar. N5 Ballaghaderreen to Longford: Previously mentioned here. New single carriageway road. M7 Junction 28 upgrade: New scheme to improve the M7 junction east of Limerick. It is currently a large roundabout. M50/M11 to Kilmacanogue: Widening of some of this section to 6 lanes. Closure of side roads, some realignment. Hopefully redesignation to motorway but don't hold your breath. Four Donegal schemes: N13 Ballybofey/Stranorlar BP, N13 Letterkenny DC Upgrade, N14 Letterkenny to Lifford, N56 Letterkenny Relief Road. The N14 scheme will connect with the new A5 on the other side of the border. M20 Cork to Limerick: Previously mentioned. N40 Motorway Reclassification: Confirmed here, this is a new plan to convert the N40 Cork South Ring Road to motorway, a 14.9 km stretch. This is an interesting development as it probably means that the Cork North Ring road (mentioned below) will also be motorway. Necessarily a section of the M8 from Dunkettle to south of Glanmire (junction 18) would have to be renumbered M40 in order to connect the south and north parts. If all this was done, Cork would have a motorway around the city on the north, east and south sides. N52 Ardee bypass: Previously mentioned. Regarding timescales, the above can be expected to get underway once the current Capital Plan is done. All Capital Plan schemes should be under construction by 2021. A few, such as the N52, will start sooner as they are smaller. N2 Ashbourne-Kilmoon Cross : This extends the improvement of the N2 from Ashbourne about 5 km further north. The standard hasn't been specified so it may only be minor online widening. N3 Virginia Bypass: The last town on the N3 to be bypassed. N4 Carrick-on-Shannon to Dromod and Mullingar-Roosky: This would extend the Dublin-Mullingar dual carriageway as far as Carrick-on-Shannon in Leitrim. N11/N25 Oilgate-Rosslare Harbour: This is the final and most southerly part of the N11 to be improved and there is online speculation that Enniscorthy-Wexford could be motorway while the remainder will be mostly online dualling. This would also complete euroroute E01 in Ireland. N14/N15 to A5 Link: Needed to connect the future N14 Letterkenny-Lifford road to the new A5 dual carriageway. N17 Knock to Tobercurry and Collooney-Tobercurry: Atlantic Corridor schemes to create a high quality route from Donegal to Cork. N21 Abbeyfeale relief road and Newcastlewest relief road: Previously a new N21 dual carriageway was on the cards. Instead these two town bypasses will be built, presumably as single carriageways. N22 Farranfore to Killarney: This will be a single carriageway that extends the future Cork-Killarney dual carriageway towards Tralee. N24 Cahir to Waterford and Cahir-Limerick Junction: This is a major new announcement that will see around 90 km of new dual carriageway on the Waterford-Limerick road. This is part of a larger idea to connect Rosslare port with the Shannon port at Foynes. These two schemes are assumed to supersede all previous N24 schemes. N25 Waterford-Glenmore: This plugs the gap between the Waterford and New Ross bypasses. N25 Carrigtwohill-Midleton: Upgrade of the existing dual carriageway. May include widening. N40 Cork North Ring Road: Will probably be progressed with the M20 and completes most of the ring road around Cork. Update 23/12/2017: A dedicated website to the M7 Widening Scheme is giving 6th Jan 2018 as the date when widening of the mainline will start. Currently work on the associated Sallins Bypass is taking place. The whole project will be done by 2019. Unfortunately a planning decision on the M28 motorway from Cork to Ringaskiddy has again been pushed back, and will now be announced on 13th April 2018. Update 16/12/2017: In a major announcement by the Department for Transport, the 35 kilometre N5 scheme from Ballaghaderreen to Strokestown has now commenced planning, and two other schemes have been bumped up to 2018 construction starts. "The government has been given approval for a major upgrade of the N5 between Ballaghaderreen and Scramoge. The Minister for the Environment has this evening confirmed that the multi-million euro project is to go to An Bord Pleanala for planning approval which will also kick-start a process of compulsory purchase orders along the route. The money for the project is already ring-fenced once it reaches this stage and the development is seen as a major step in enhancing one of the busiest national routes in the country." At either end, the new road connects to other recent improvements; to the west, the Ballaghaderreen bypass (2014) and to the east Scramoge (2004). Another article on the scheme features a map, and this one has a podcast about the making of the CPOs. However some locals have expressed concerns that the new route will deprive the bypassed towns of passing trade. In the past, the N5 was in such bad shape that journeys from Dublin to places in the west of Ireland like Westport took so long that motorists stopped for refreshments numerous times. However with all the improvements made in the last few decades the journey time has dropped considerably and any town that relied on passing trade will have gone into decline (though there are other forces at work). So in this case there may be justifiable fears over the new road's effects. In other news, the N52 Ardee Bypass, which had languished in obscurity for many years - first being in planning, then suspended, then back in planning - is now headed for a 2018 construction start. The 4.5 km road will be built to single carriageway standard. Also planned to break ground in 2018 is the N4 Collooney-Castlebaldwin dual carriageway in Sligo. This extends the dual carriageway south of Sligo town a further 14.7 km. Update 07/12/2017: There has been another setback for the Galway Bypass. The can has been kicked down the road again, with a planning application now not due to be made until mid-2018, as reported. There is no confirmed start date for construction though it can be assumed to be around 2021. Some more pictures of the M11 Enniscorthy Bypass are available. These were put up on the project website, and mirrored in an easier to read format on Boards.ie. They show many major structures making progress and some long shots of the earth formations passing through the land. Update 24/11/2017: Just two quick updates. Previously it was speculated that the N22 Ballyvourney to Macroom might start a year early, in 2019. Unfortunately this now will not be happening and it's back to 2020 for the scheme. Better news for the N4 Collooney-Castlebaldwin project, which has gone to tender. Update 13/11/2017: In light of the recent news that the new N21 Adare-Rathkeale road will be motorway, a new M21 page has been created to track its development. As of now, it is expected that this should be completed by 2024. "Thank you for your email of 5 November 2017 regarding the Tranche 2 motorway service areas. The position in relation to your enquiry is as follows. Following the resolution of the procurement challenge to this contract award, Transport Infrastructure Ireland (TII) has resumed negotiations with the preferred bidder. TII is working with the preferred bidder on all of the documentation which is required to close this contract award. It is likely that the contract will be signed by TII early in 2018, and that construction works would commence on site around the middle of 2018, allowing for the Design Period. It is estimated that the construction period for the service areas on the M6 at Athlone and M9 at Kilcullen would be approximately 12 to 15 months for full completion, however, the Gorey service area is expected to be completed within 3 to 4 months." The above would indicate that the M6 and M9 MSAs will open around Q3 of 2019, and the M11 MSA in October 2018. Separately, it has been reported that work is now visible on the M7 widening scheme. It is now marked as under construction. Update 05/11/2017: A year ago TII announced planning on Tranche 4 of the Motorway Service Areas programme. Now according to the dedicated site for the tranche, expected completion dates have been announced. The M3 and M6/M17/M18 services areas are planned to open in 2019, and the M18 area should open in 2020. 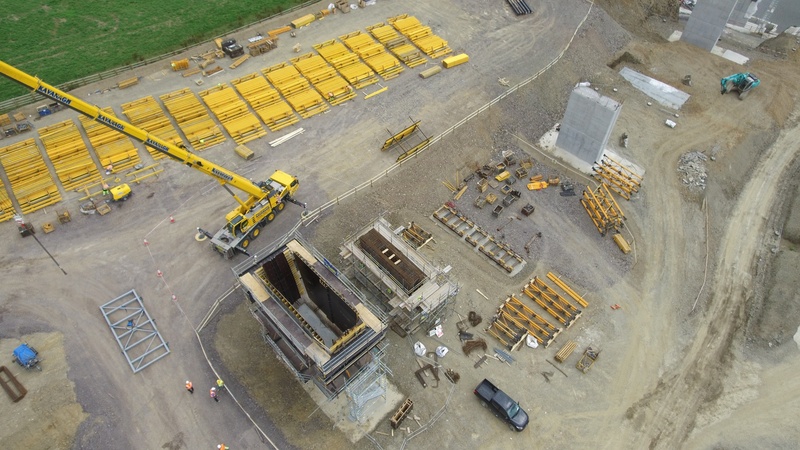 Using a drone and pulled from the New Ross bypass website, a collection of spectacular construction photos have been cross-posted to photobucket and Boards.ie: 1, 2. "The Rathkeale to Adare Junction Study indicated a slightly positive benefit from the provision of a Junction. Two potential junction locations, Option A (West of Croagh) and Option B (East of Croagh) were identified following the decision to provide an additional junction between Rathkeale and Adare. Following consultation with interested parties and assessment, Option B (East of Croagh) has been selected as the preferred option." "Work will also continue on the preparation of the statutory documents such as the Environmental Impact Assessment Report and Motorway Order." This means that the N21 element will almost certainly be a motorway. A new page for same will be created soon. Note that the N69 element will not be a motorway, though it will be unusual in an Irish context: a grade-separated single carriageway road. "Additional lands will be required for a Service Area, Drainage/Flooding issues, Access Roads and due to severance etc." The map on this site has been updated. Update 18/10/2017: A spectacular aerial shot from a drone of the new N25 New Ross bypass shows the progress so far. "Currently 55 projects in 23 counties are on the list - the number has varied little in recent years and many of those included feature repeatedly. They range from roundabouts, realignments and local relief roads to long stretches of dual carriageway - projects costed at anything from tens of thousands of euro to many millions. At the moment there is also a motorway project - the M20 Cork-Limerick route which the Taoiseach announced last Friday would be included in the new national Capital Investment Plan to be published next month - so while no funding has been allocated for it just yet, it appears its suspension has been suspended. National roads make up just 5,300km of the 97,000km of roads in Ireland - fewer than 6% of the total network - yet they carry 45% of the nation's traffic so their significance far outstrips their size." In his speech before Cork Chamber of Commerce, Mr Varadkar said it was his intention "to bring forward the M22, the Ballyvourney to Macroom Road, allowing it to go to tender next year, with construction the year after". Update 13/10/2017: Prolific Boards.ie poster "M17" is at it again, this time photographing up close the N25 New Ross scheme and M11 Enniscorthy bypass. M11: ,  (a culvert to allow a river to flow under the road). The October Budget for 2018 was announced but for now it's a bit light on detail on upcoming road projects, and hasn't confirmed any new ones. It does mention however that €15M will be spent on the M20 between Limerick and Cork over the next four years. This is enough to get it planned, designed and ready to build, so it is looking quite likely it will start in 2021. If so it should be done by 2024. The Taoiseach, Leo Varadkar, tweeted today that the project is officially back on. A webpage covering the revised Capital Spending Plan up to 2021 includes a Capital Tracker document which lists the expected completion dates of all the major road schemes coming up in that period. Some are conservative - for example the N5 Turlough-Westport dual carriageway is not expected to start until 2021 but previously this was to be ready in 2019. For now we will have to wait until details of the revised Capital Spending Plan are revealed. Update 27/09/2017: Today, after 2 years and 9 months of construction, the M17/M18 motorway scheme opened to traffic. It connects the town of Tuam, northeast of Galway, to Gort, southeast, and ties into the existing M18. The scheme measures 57 km and this completes the M18. It also marks the creation of a new motorway, M17. There is now a continuous motorway or high quality dual carriageway between Limerick and Galway. This marks the first time this has been achieved between two Irish cities where neither is Dublin. A map of the route can be seen here. As always, the M17/M18 thread on Boards.ie is full of the latest photos and updates. The Saw Doctors, an Irish rock and folk band from the 1990s, were contacted for comment. Update 23/09/2017: The tender for widening and rebuilding the M7 from Naas to west of Newbridge has been awarded to SIAC/Colas JV. It has been reported that work is to start immediately. Work on widening the motorway to 6 lanes will be complete by 2019 and the rest of the elements by 2020. The road will remain open throughout the duration. "The construction work will include six new structures, including two bridges over the river Liffey, a bridge over the Grand Canal, the new Osberstown Interchange bridge over the M7 motorway and a minor road bridge carrying Osberstown Road over the Sallins bypass. The Sallins bypass bridge under the main Dublin Cork railway line will be constructed by Irish Rail under a separate but parallel contract." "This project which also covers a new interchange at Millennium Park and the Sallins Bypass should be completed by Spring 2020 with the much needed widening of the M7 to be completed by Autumn 2019." "The new Gort to Tuam M17 motorway is due to officially open, ahead of schedule, next month. Galway East Independent T.D Sean Canney says the route will be officially opened on September 27th. Deputy Canney said it's vital that towns such as Tuam, Athenry, Loughrea and Gort are prepared to benefit from the opening of the motorway. He said he will be pressing IDA Ireland to engage with clients to put forward a case for foreign direct investment along the corridor route. Speaking to Galway Bay fm news, Deputy Canney said the opening of the M17 motorway on September 27th will enhance travel times for motorists." Today, a cycle event took place along the whole route including the dual carriageway Tuam Bypass. Dedicated Boards.ie poster M17 has some photos. Update 24/08/2017: Another minor design update has been put out for the N6 Galway bypass. The main change is to the Doughiska interchange in east Galway which has had its layout tweaked again. There seems to have been progress on getting the M17/M18 project to open sooner than November. The motorway will be completely finished in only a few weeks. Now it seems it may open in early October. Fingal County Council in Dublin are planning an improvement of junction 2 on the N3 at Blanchardstown. The overbridge will be duplicated and approach roads widened. Plans are discussed from a cycling perspective here. Update 31/07/2017: Boards.ie poster Geogregor has taken a stunning series of photos of the new high-level bridge that will form the New Ross bypass in Wexford. They can be seen in this post, and this, and this. The masterplan for a controversial service station on the M6 near Oranmore has been published online. The project is being led by Transport Infrastructure Ireland under its national motorway service area plan. Following a site selection study, a preferred site for the development was identified around 5.5km north east of Oranmore, in the townload of Lisheenkyle West. Concerns have been raised that the proposed service station would be in competition with the Galway Plaza development at the Loughrea junction on the M6. The developments would be under ten minutes apart for motorists travelling on the route. Minister for Transport Shane Ross has today confirmed that the Ardee bypass is to proceed - after funding was secured and made available for the long awaited project. Independent councillors Kevin Callan and Jim Tenanty have told ThisIsArdee.ie today that they have received confirmation from Ross that the bypass has finally been given the go-ahead, after years of waiting and false dawns on the major project. Late last year, the western bypass for Ardee - seen as the key to alleviating the town of its traffic gridlock problems - was made a priority case by Transport Infrastructure Ireland, meaning it has moved up the list of projects awaiting funding to begin. The lands on the north-west side of the town have long been been acquired and the only obstacle standing in the project's way is the financial allocation needed. The project has been 'shovel ready' since the acquisition of those lands. The single carriageway road will be 4 km long and its route is indicated on this map. Speaking on Thursday, Fine Gael TD for Louth Fergus O'Dowd welcomed the announcement. "I welcome the news that funding will be made available for an online upgrade of the N2, extending from North of Ardee to the south of the Castleblayney Bypass. "I have been in constant communication with the Minister for Transport, highlighting the need for this piece of infrastructure," O'Dowd added. The N2 has already been improved as it passes Castleblayney and further to the north. Costs have not been confirmed. Update 27/07/2017: Pictures have been put up on the N25 New Ross website showing progress on structures and earthworks. Of particular interest are these: , , , , . The M11 Enniscorthy website has also been updated, though as usual the pictures aren't great - all taken from a long way up: , . An aerial image of the site preparation works for N22 Ballyvourney-Macroom is shown in this article. Update 18/07/2017: The Government has announced that a rainy-day fund into which they had previously committed to paying €1 billion per year will now be scaled down and there will be an extra €500 million available for capital spending each year between 2019 and 2021. The underground railway project, Metro North, now seems likely to be moved forward for Dublin, and the M20 motorway between Limerick and Cork will very likely be built. There have not been any specific projects mentioned so far, however, and the 500 million will be across all capital expenditure - public housing, education, schools, roads and public transport. An article in the Irish Times claims that the M20, if built, would create up to 5,400 jobs and generate €128 million in accident savings, lost time due to congestion and economic effects. RTE has published a full summary of the business case for the M20, if you want a longer read. Pages 11-13 cover potential accident reduction (2.4 fatalities per year) and 14-19 cover the economic benefits. 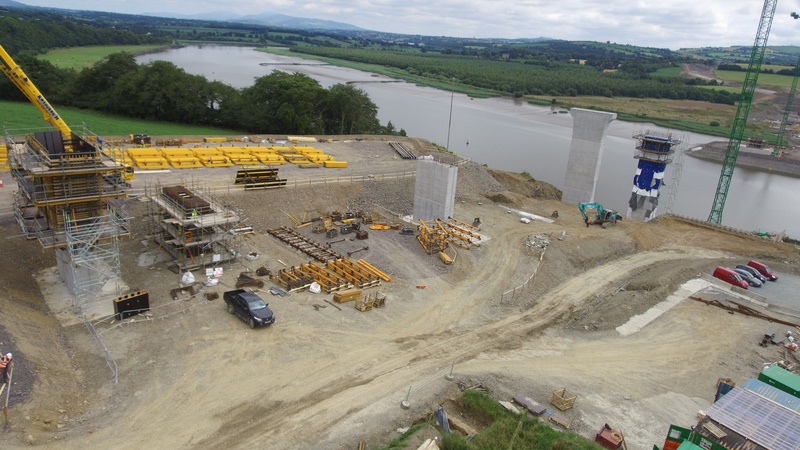 Update 26/06/2017: Some decent photos of the N25 and M11 schemes: bridge abutments for the bridge over the River Barrow, part of the N25 New Ross project, and a large bridge for the M11 at Solsborough. 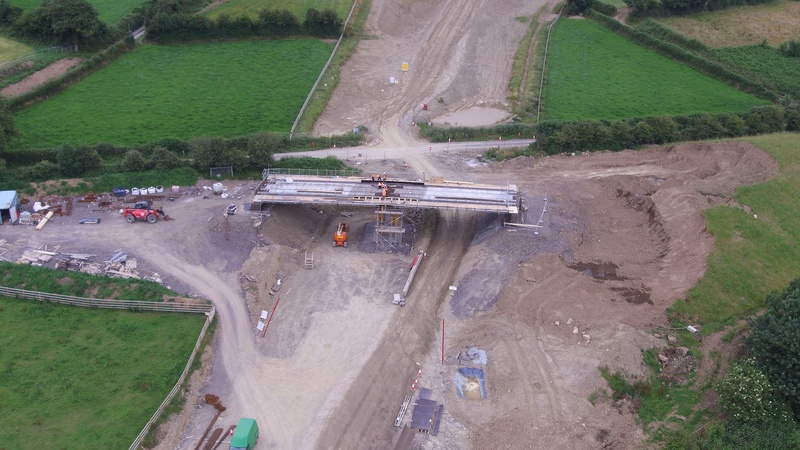 This bridge is actually for the N30 dual carriageway segment of the scheme and will cross a road, a railway line, and the river Slaney in one go. Click for an archive of older news items.